Specialty: Developing Vacuum tubes, televisions, military & space electronics, satellite communications. Early and substantial contributor to the development of the transistor.Developed commercial mainframe computer systems during the late 1950's & 60's. One of the largest and most influential electronics companies during the 20th century. "From Vacuum tubes to Solid state Electronics"
Radio Corporation of America (RCA), was an early supplier of vacuum tubes from radio industry and other electronics. 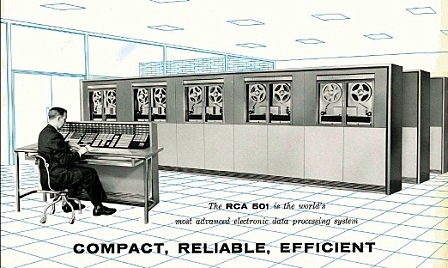 RCA was one of the eight major computer companies (along with Burroughs, Honeywell, Control Data Corporation, NCR, IBM, General Electric and UNIVAC) through-out most of the 1960s. RCA's turnaround was its computer division. It was started in 1958 by Sarnoff and then RCA President John Burns. 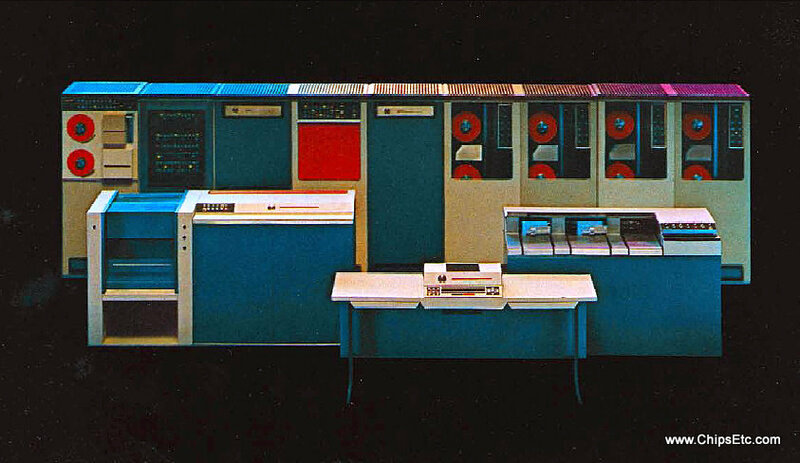 RCA ended it's computer business in 1971. 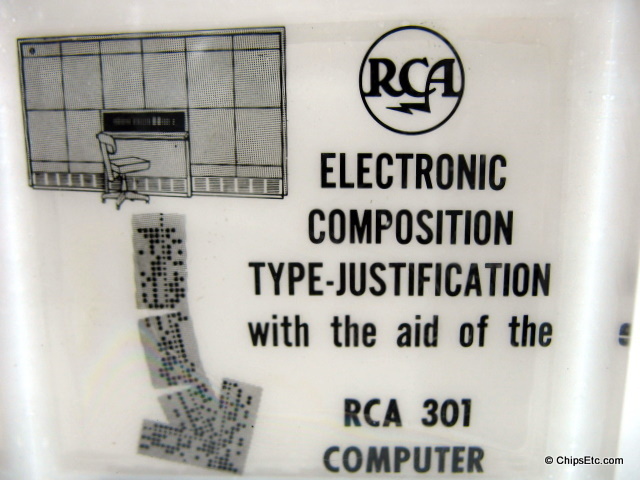 Early RCA computer models included the RCA 300, RCA 301, RCA 501 & the RCA 601. 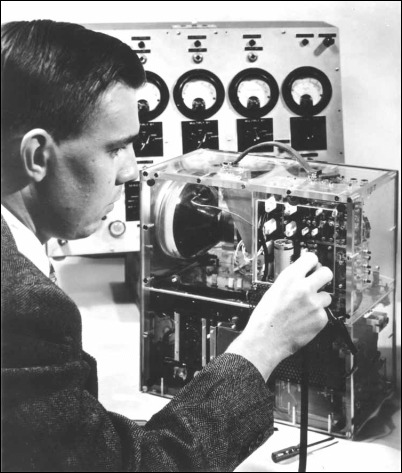 The history of computing hardware starting at 1960 is marked by the conversion from Vacuum Tubes to Solid State Transistors and later the Integrated Circuit. 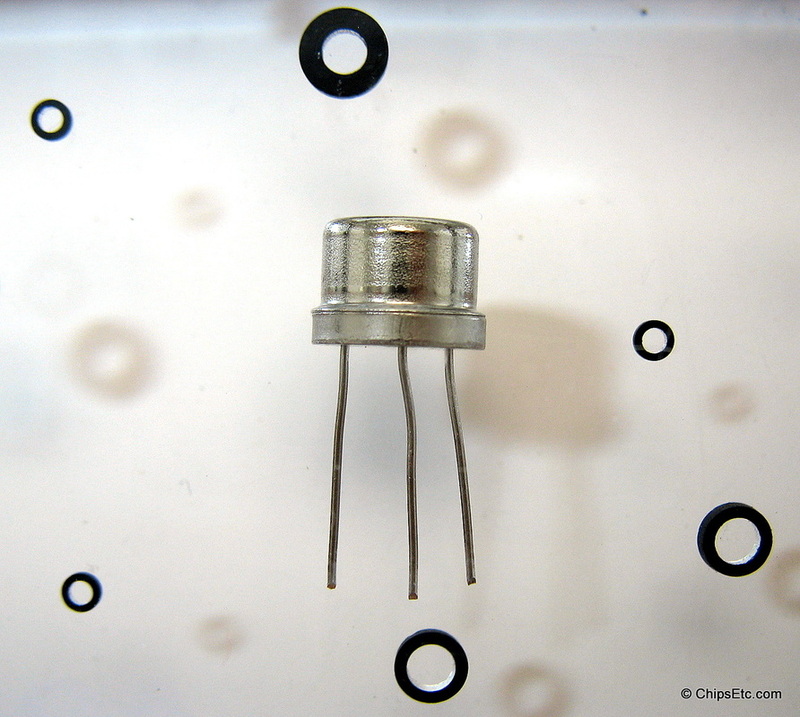 By 1959 discrete transistors were considered sufficiently reliable and economical that they made further vacuum tube computers inefficient and uncompetitive. Computer main memory slowly moved away from Magnetic Core Memory devices to solid-state static and dynamic semiconductor memory, which greatly reduced the cost, size and power consumption of computer devices. 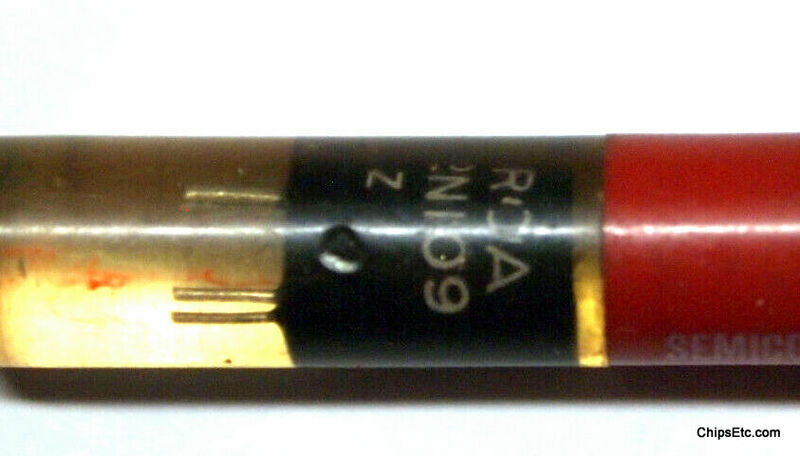 PNP Alloy Junction transistor from RCA semiconductor products of Somerville N.J. 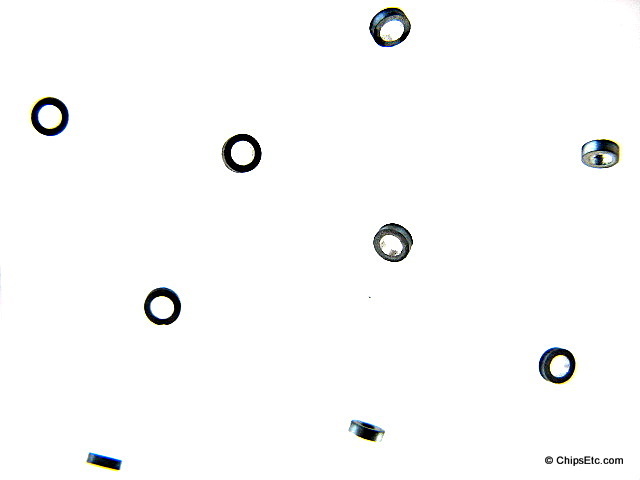 The transistor floats in a clear liquid in the key fob. 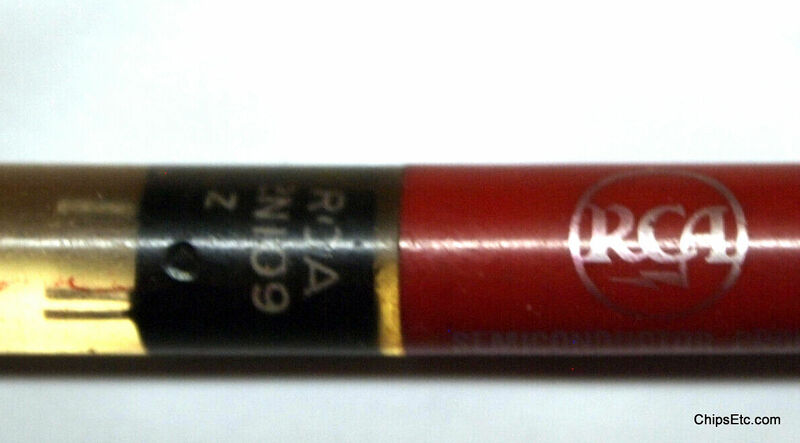 ​The RCA 2N109 was one of RCA's first commercially available transistors, first introduced in 1955. 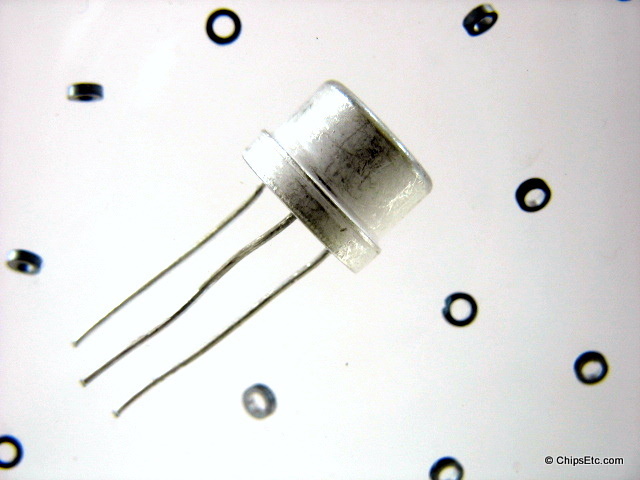 It was designed for use in audio output circuits for early transistor radios. 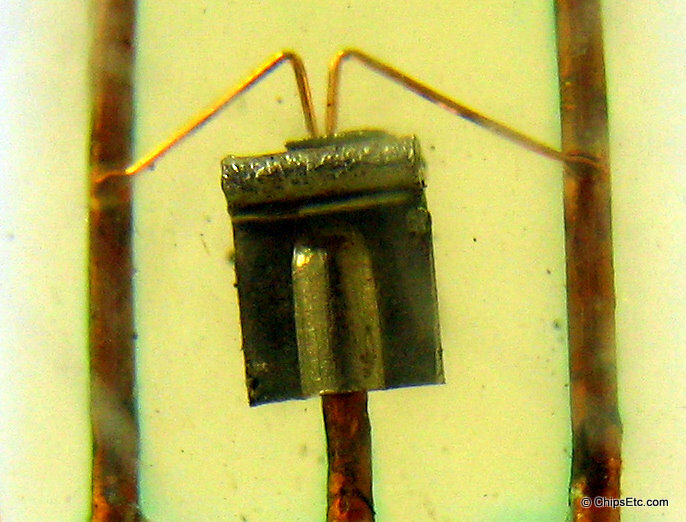 Later, the 2N109 would become a long-time favorite among hobbyists for use as a a general purpose transistor. 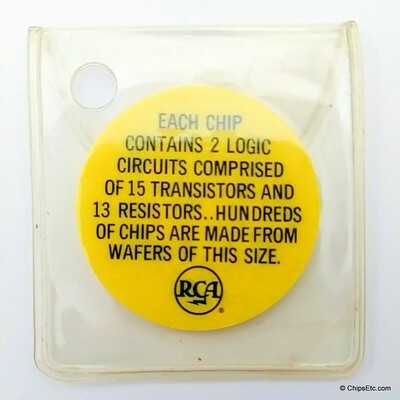 On March 18th 1959 the U.S. Army Signal Corps and RCA announced development of micromodules for electronic devices which ultimately could allow up to 500k components to be packed into a cubic inch of space. 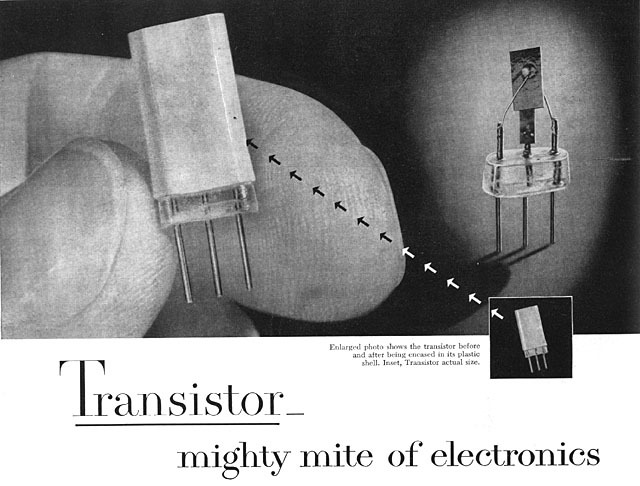 As electronic systems grew more complex, engineers sought simpler ways to interconnect the thousands of transistors used to implement them. Government agencies funded micro-module and multi-chip hybrid circuit projects in search of a solution to this “tyranny of numbers” problem. The micromodule and other ‘lego-like’ alternatives were a clever solution to the problem of interconnections. While these techniques substantially enhanced the reliability of electronic components, however, the interconnections were still there, functioning as a physical limit to further miniaturization. 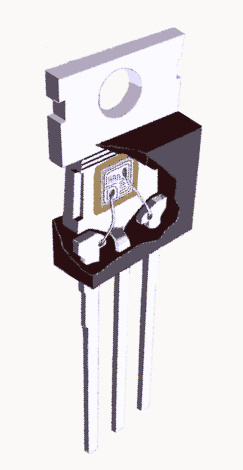 In 1958, the U.S. Air Force and Westinghouse adopted the term "molecular electronics" in order to describe their radical joint research program that aimed to leapfrog beyond both the conventional approach to circuit integration proposed by RCA and the U.S. Army Signal Corps and the burgeoning efforts to build monolithic integrated circuits at Fairchild Semiconductor and Texas Instruments. 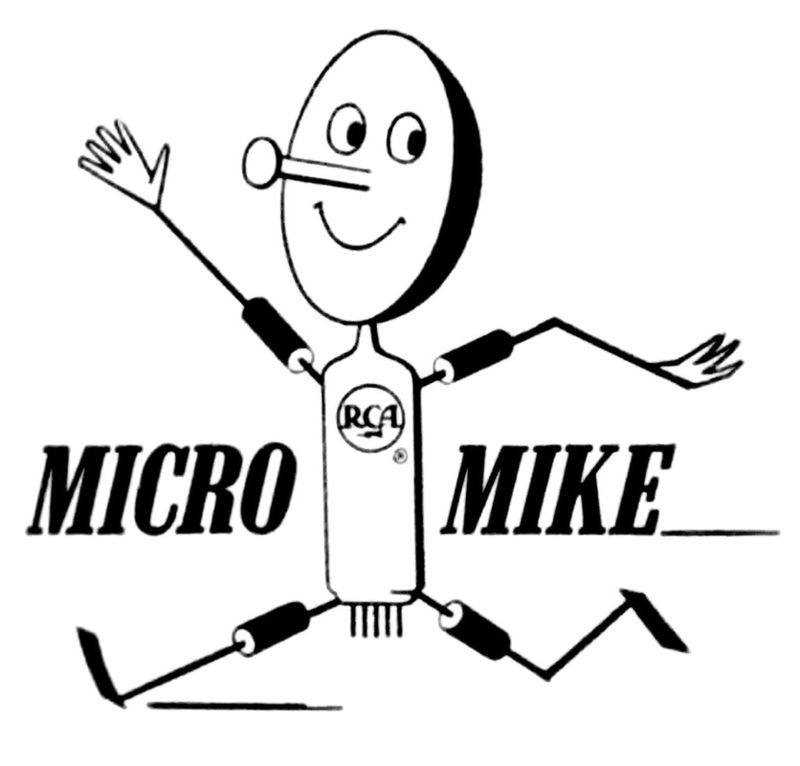 Because of the introduction of integrated circuits in 1960 there was no production of micro module equipment and the Micro-module packaging technology quickly became obsolete. 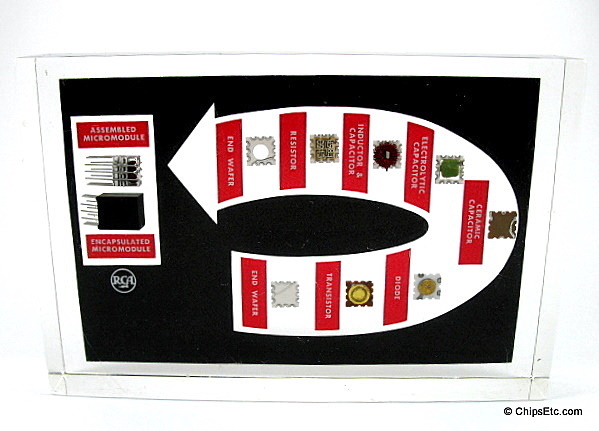 This rare Lucite display contains actual components showing each of the steps necessary to manufacture a Micro-module: an end wafer, transistor, diode, ceramic capacitor, ﻿electronic capacitor﻿, resistor & end wafer. 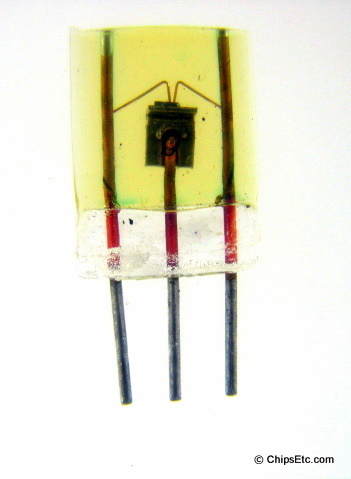 At the end of the arrow are two assembled micro modules, one is the stacked and soldered micro module and another is finished product and is encapsulated. These Micro-modules were manufactured at RCA's Semiconductor and Materials Division in Somerville, New Jersey. Measures 6 x 4" x 1" thick. 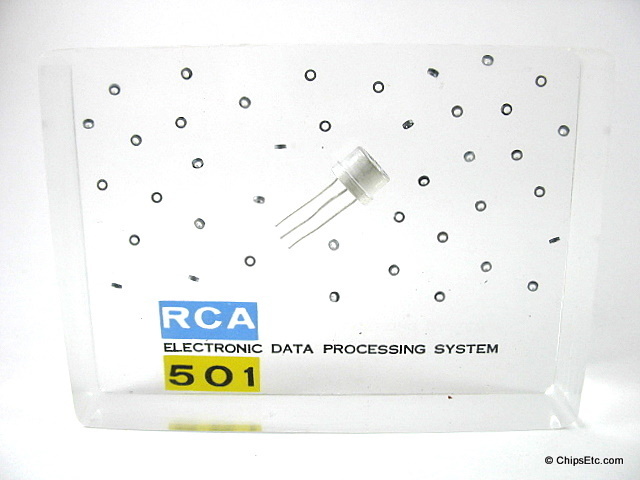 The RCA Model 501 Electronic Data Processing System (EDP), released in 1958, was the first commercial fully transistorized computer system, replacing the Vacuum Tube technology of the previous model, the RCA BIZMAC (released two years earlier in 1956). 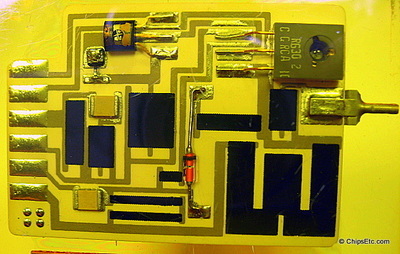 The 501's many transistors were mounted onto PCB module cards. 16k Memory was standard and was composed of Magnetic Core Memory Modules. 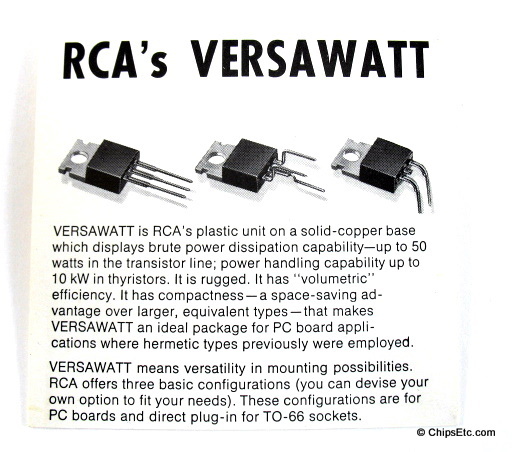 RCA eventually withdrew from computer manufacturing in 1971. 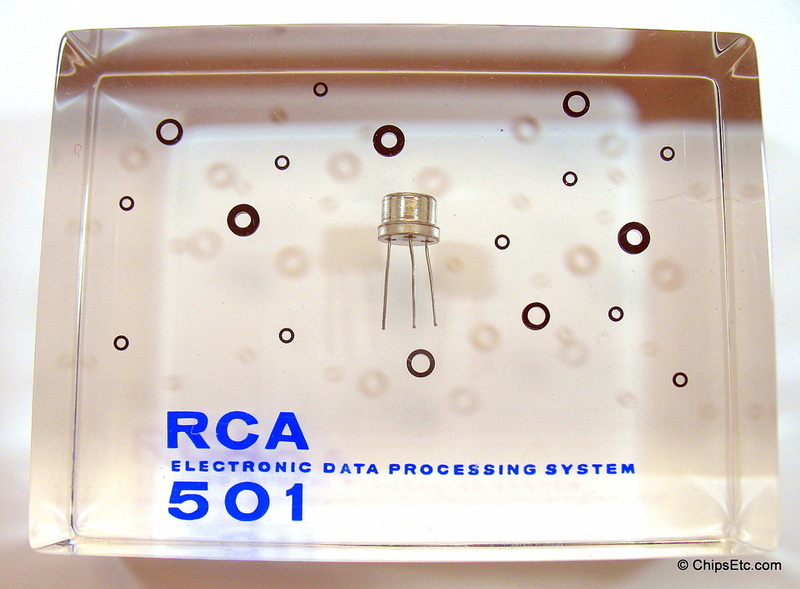 Clear Lucite paperweight has an actual RCA 2N581 transistor as well as a bunch of Core Memory "Doughnuts". Item has "RCA 501" and "Electronic Data Processing System" embedded inside as well. RCA # 3696, 3696A, 3697, 3697A, 2N1495, 2N1289, and the 2N581. This Clear Lucite paperweight is similar to the item above with a slightly different design. 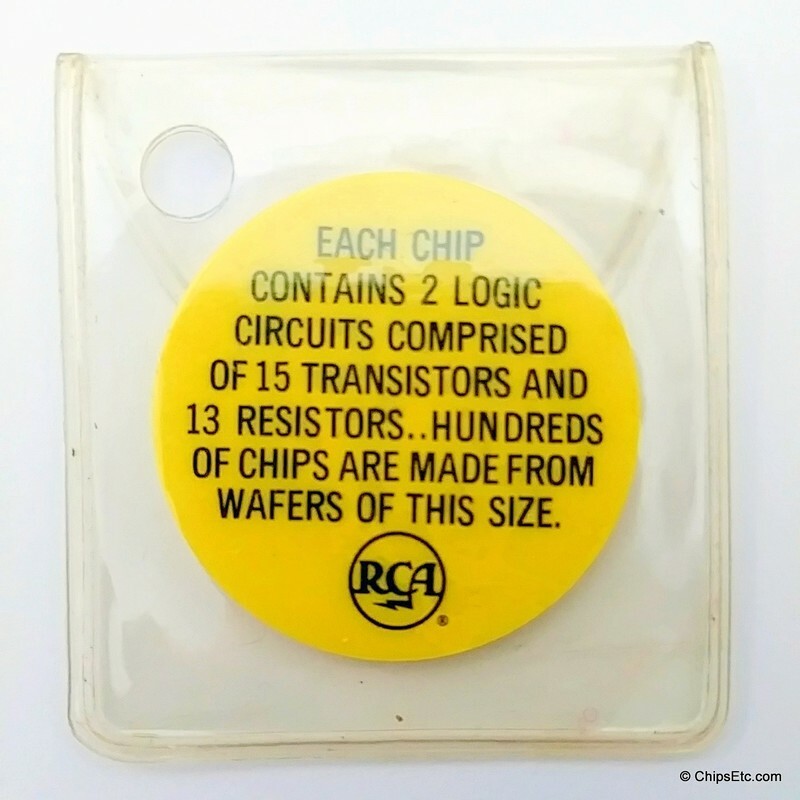 It also contains an actual RCA three-lead transistor as well as a bunch of Core Memory "Doughnuts". 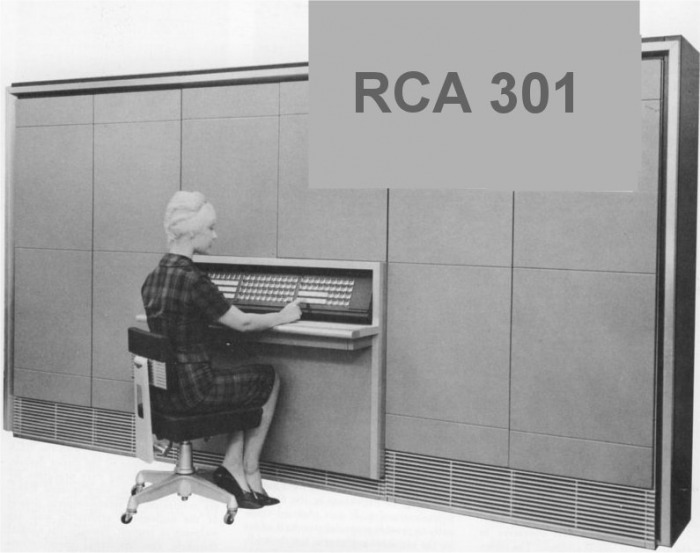 The RCA 301 Electronic Data Processing System was a business oriented medium sized computer with central memory built from magnetic cores. 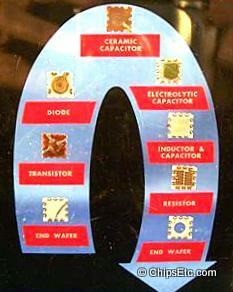 Its logic circuits used solid state circuits made from discrete transistors and diodes. 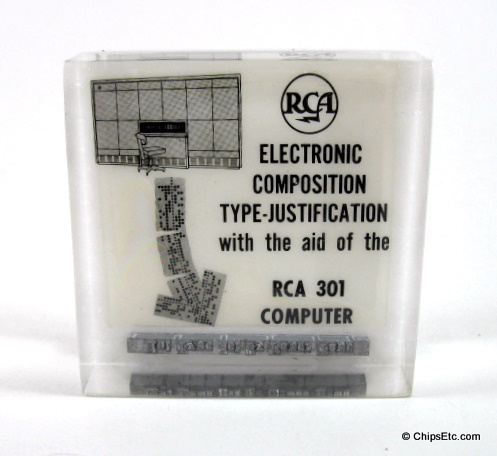 The RCA 301 was offered with between 10k to 40k of core memory. 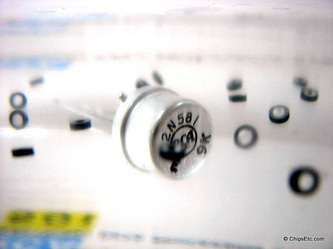 Input was from Magnetic tape, paper tape, or punched cards. 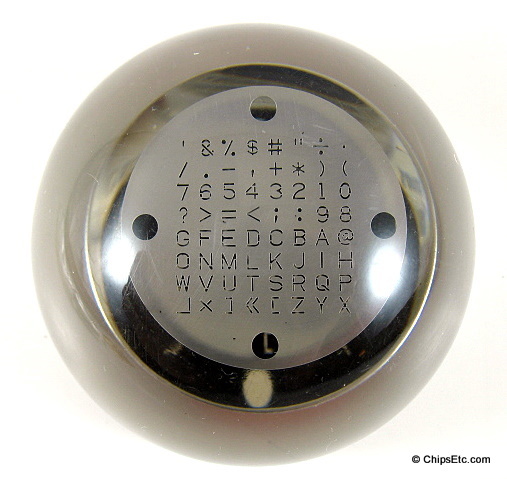 Clear Lucite paperweight with a white backing. 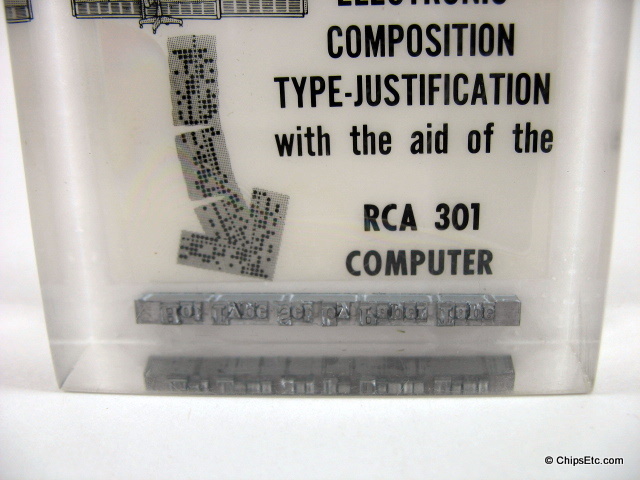 The graphics are wonderful with a black and white mainframe computer with chair in the upper left, and an arrow comprised of miniature punched cards pointing to an actual metal typeset embedded within the acrylic at the bottom that has individual pieces that spell out the words "Hot Type Set By Paper Tape". Measures 2 1/4" square, it is tapered when standing, from a thickness of 7/8" at the bottom to 11/16" at the top. 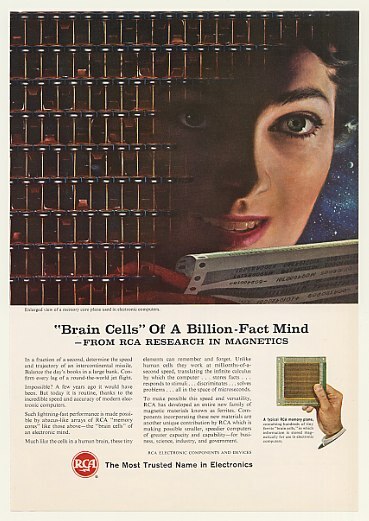 In 1952 RCA engineers were busy experimenting with new Transistor designs with goals of developing the worlds first experimental All-Transistor Television. 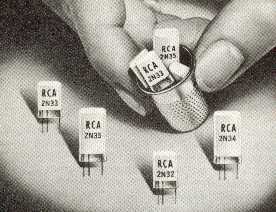 In 1953 RCA introduced to the public the First Transistorized Television using Transistors similar to these. 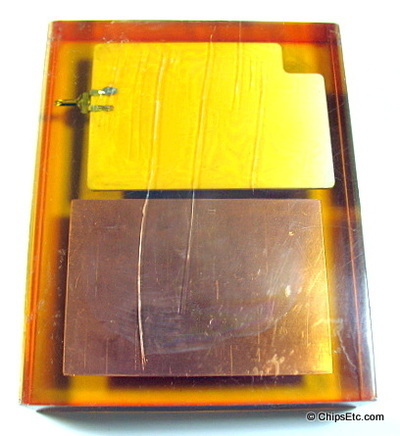 The earliest Junction Transistors were constructed using glass bases with molded epoxy encapsulation surrounding the circuitry. It was soon discovered that this construction process led to moisture contamination and caused the Transistors to fail prematurely. Most manufactures would quickly change to the new process of using hermetically sealed metal cases which solved the issue with premature failure. Clear Lucite paperweight with two early examples of RCA Germanium Transistors embedded inside. 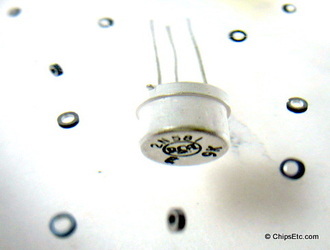 The white one (Left) is a low power RCA 2N34/2N35 Germanium Alloy Junction Transistor used for Audio circuits. 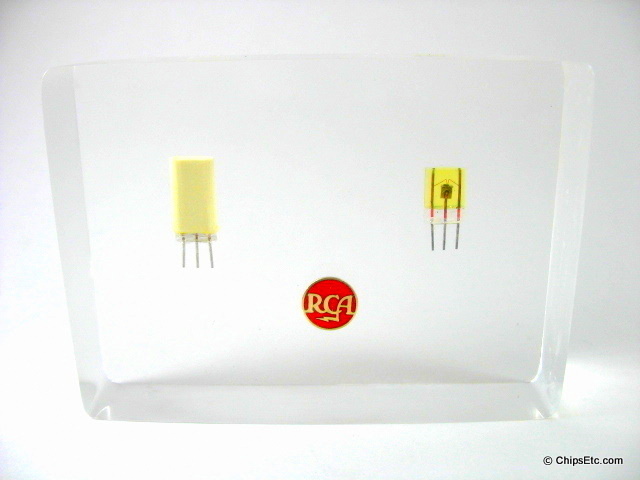 The clear one (Right) is an RCA 2N32/2N33 Germanium Point Contact Transistor used for RF/IF high frequency circuits. 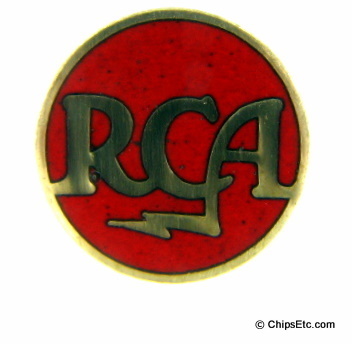 Has the RCA logo button made of brass and red enamel embedded inside as well. Measures 1" X 2 3/4" X 3 3/4". 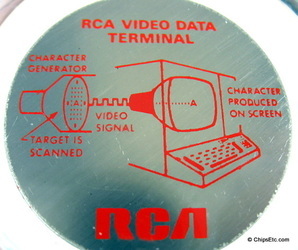 This paperweight contains a character generator's Stencil (or Mask) made by RCA for use with an RCA computer's Video Data Terminal (VDT). The VDT was made up of a Charactron electron gun, the character generator mask (stencil), beam deflectors, and a phosphor coated screen, all sealed in a glass vacuum tube. 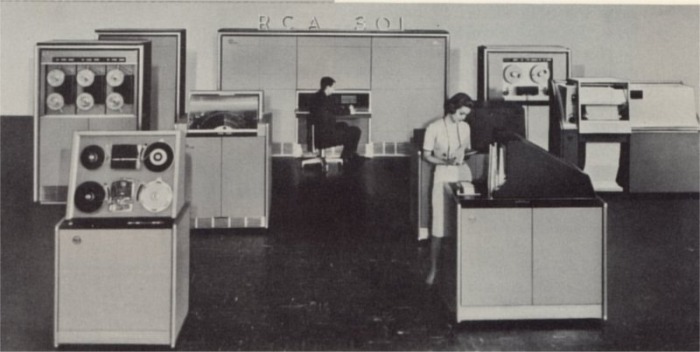 RCA applied for the contract to manufacture the new SAGE Radar computer system for the U.S. Government, but it ultimately was awarded to IBM. 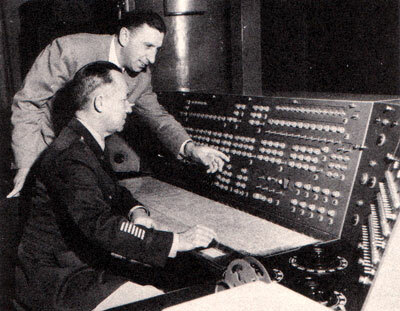 RCA was also competing with both General Dynamics and Hughes for VDT display technologies for use with the advanced display systems updates for the SAGE computer and radar system during the Mid to late 1950's time period. 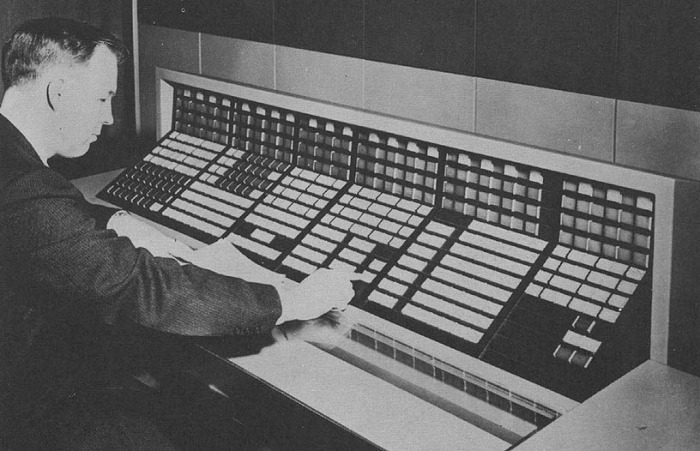 The development of the SAGE computer display systems in the 1950's introduced the computer user to the CRT as a viable display and interaction interface. Paperweight manufactured by Clearfloat of Pawtucket, Rhode Island. 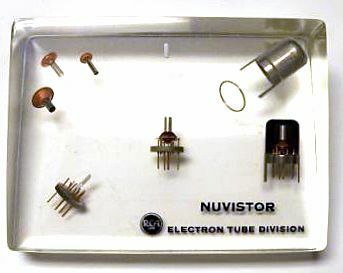 The RCA Nuvistor was a thimble-shaped triode vacuum tube which offered a much smaller package size compared to typical tube designs of the day. 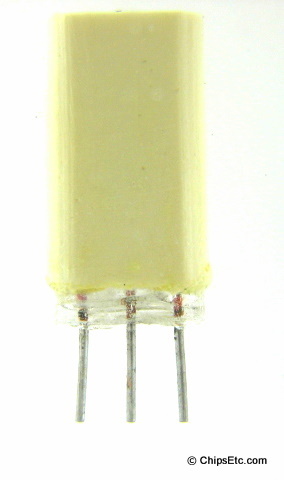 This is an RCA Semiconductor salesman's sample. 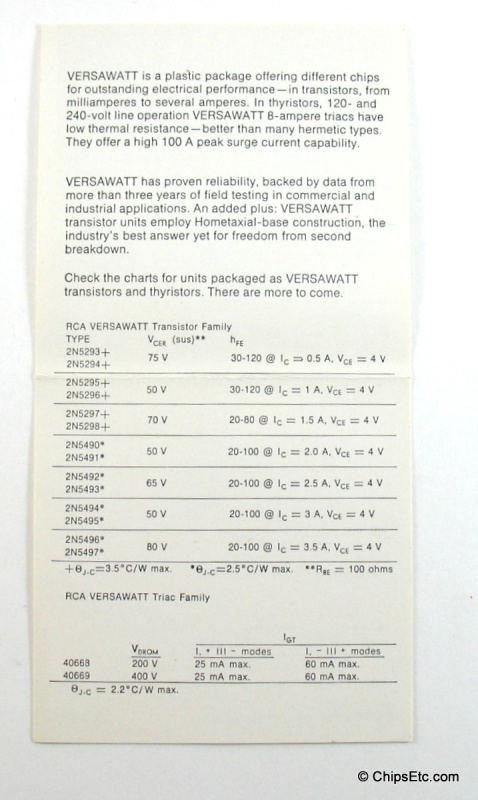 It would have been used out in the field to show potential RCA customers the various types of transistors & computer diodes available for sale at that time. 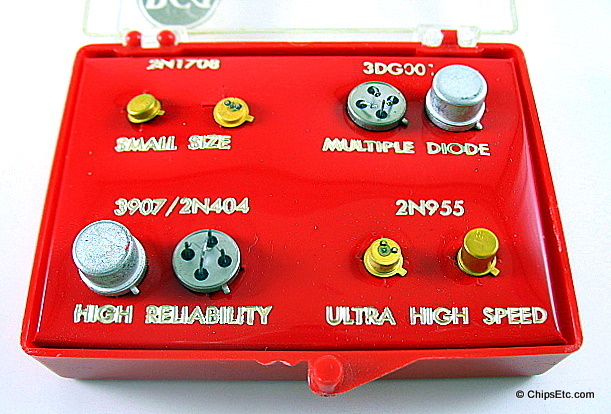 Clear plastic case features four different types of RCA semiconductor components including transistors & computer diodes (each part shows an example of a sealed component and an un-encapsulated component) mounted on a red plastic base - The small size: gold RCA 2N1708 , the Multiple Diode: RCA 3DG001, the High Reliability: RCA 3907 / 2N404, The Ultra High Speed: gold RCA 2N955. 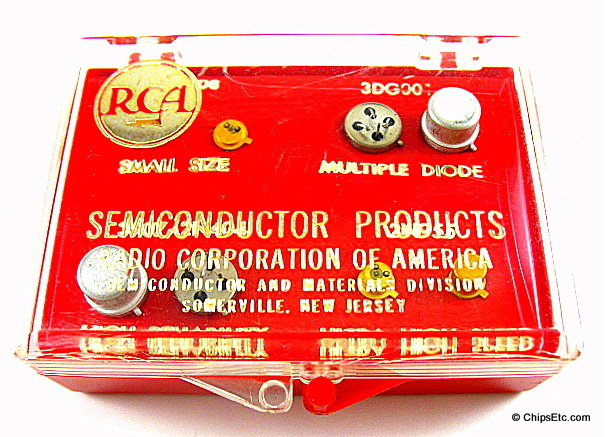 Cover reads: "Semiconductor Products, Radio Corporation of America, Semiconductor and Materials Division, Somerville New Jersey"
The RCA "Spectra 70" was a Third generation computer that featured the industry's first use of a monolithic integrated circuit in a full scale electronic data processing system. 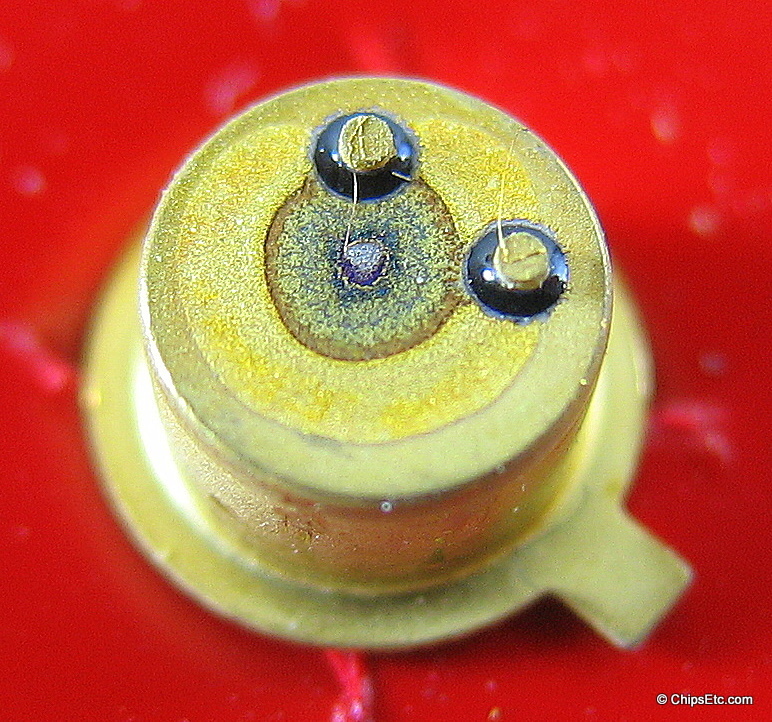 This is a RCA Spectra Tie Tack that features a circuitry motif and has an actual RCA Spectra Computer chip mounted in the center. 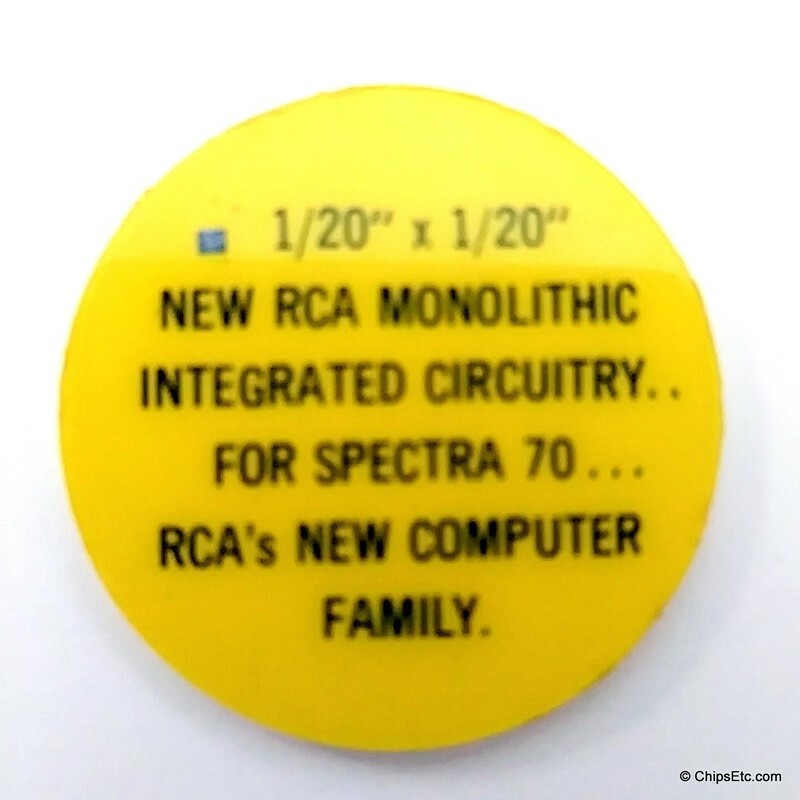 Marked on the back is "RCA Spectra 70". 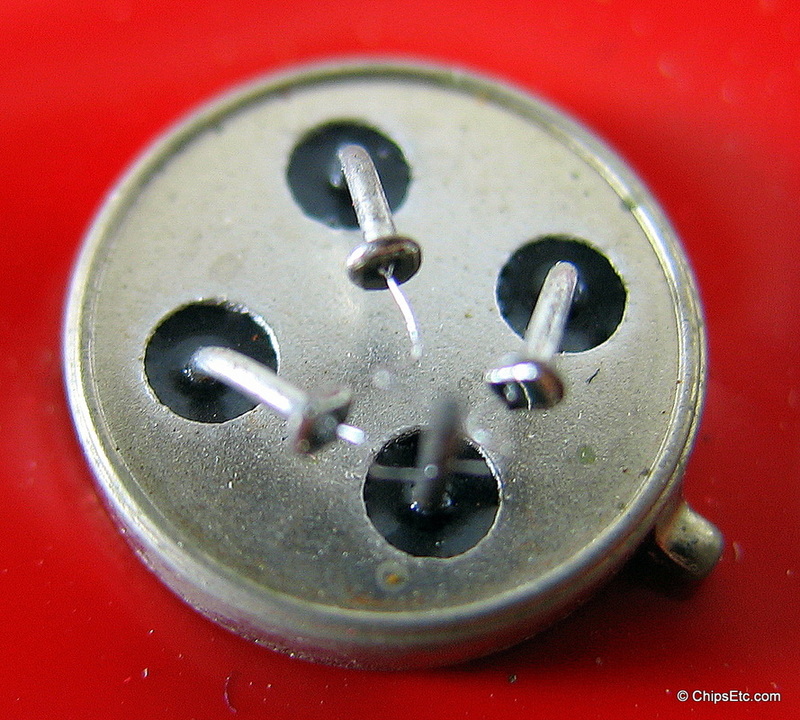 This Tie Tack was produced for RCA by the Kinney Co.of Providence, Rhode Island, a major manufacturer of high school, college, and military jewelry. 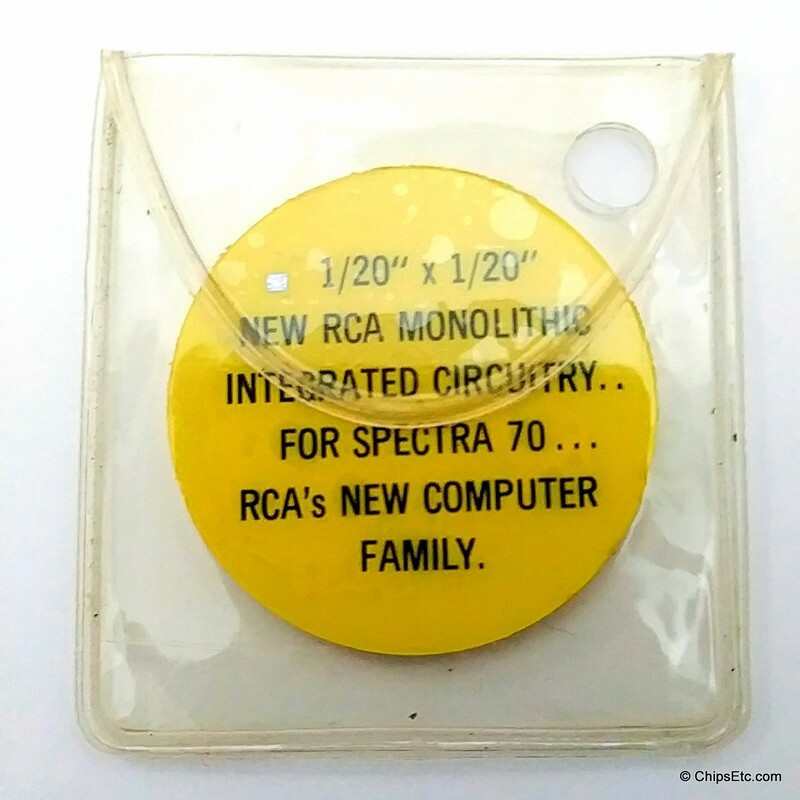 This promotional acrylic Token from RCA features an actual Integrated Circuit chip that was the type used in their new Spectra 70 line of computers. One side of token Reads: 1/20" x 1/20", New RCA monolithic integrated circuitry..for Spectra 70...RCA's new computer family. ​Other side of token reads: Each chip contains 2 logic circuits comprised of 15 transistors and 13 resistors. 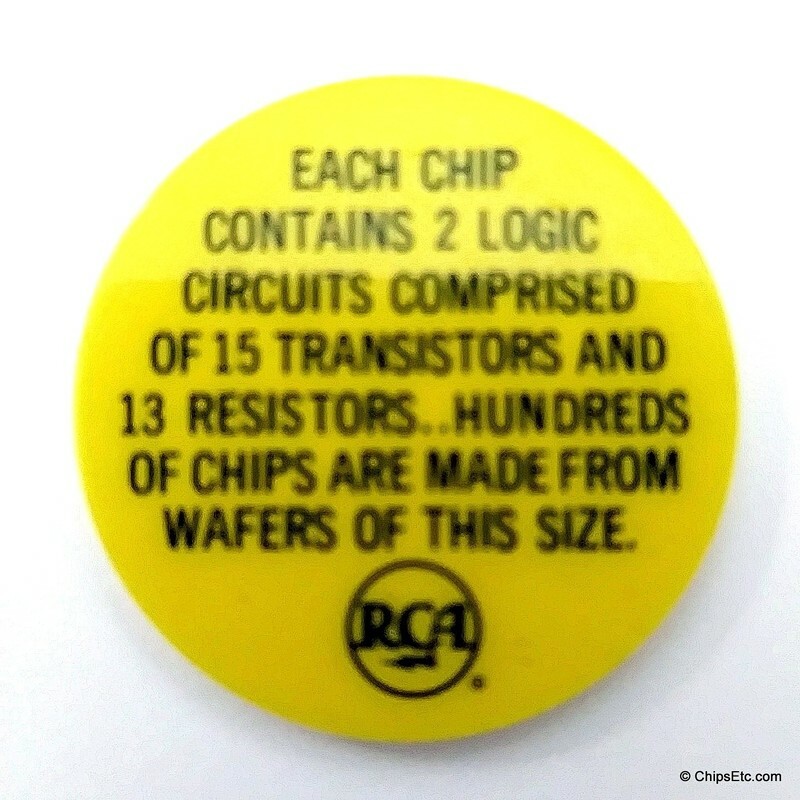 Hundreds of chips are made from wafers of this size. Comes in original plastic pouch. 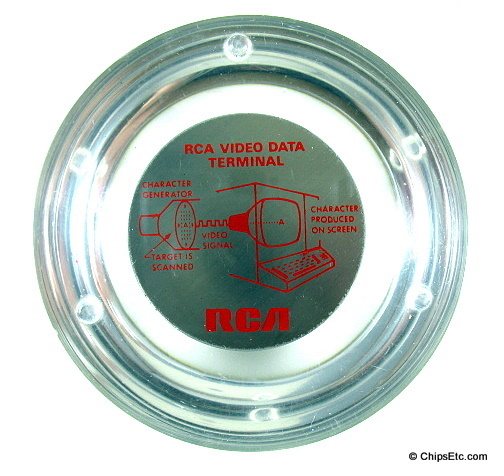 This limited edition paperweight celebrates RCA reaching the milestone of producing one million Solid State Ceramic Circuits for use in their line of televisions. The actual circuit embedded inside is identified as being the 1,000,015th unit to be manufactured. RCA introduced it's XL-100 AccuColor line of color televisions in 1970. The XL-100 was RCA's first completely solid state television (no vacuum tubes used except for the picture tube). 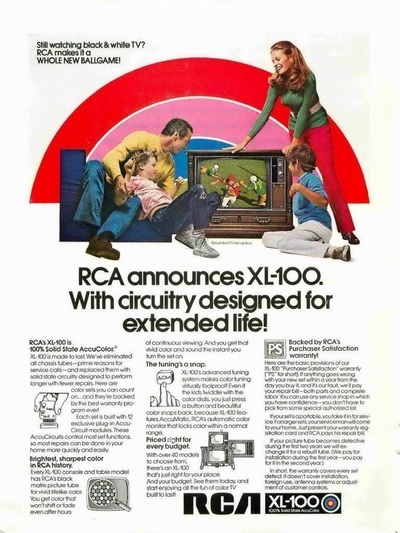 By August 1972, RCA had produced one million solid state circuit televisions! 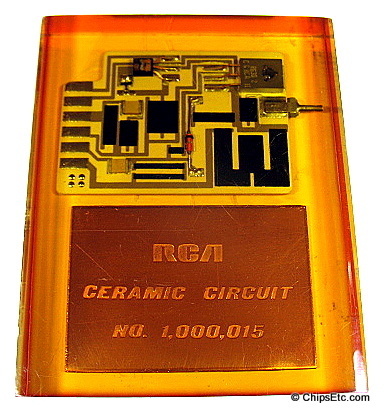 RCA's use of Solid State circuit boards allowed for reduced manufacturing costs, easier servicing, and greatly improved reliability over previous vacuum tube technology. 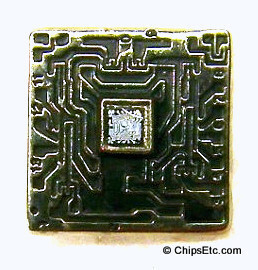 The new XL-100 used 12 plug-in type solid state circuit boards, know as AccuCircuits. Each AccuCircuit was composed of a Ceramic Circuit board that contained discrete components such as transistors, resistors and capacitors. 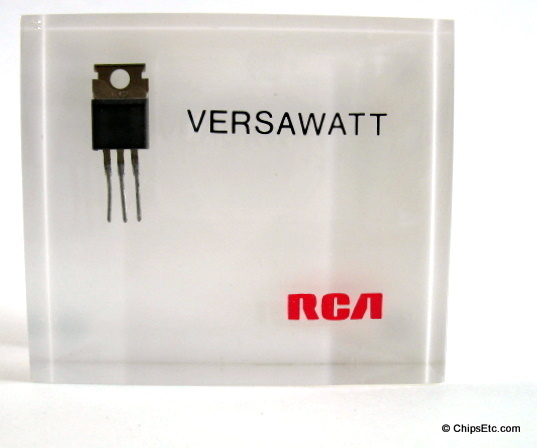 This 3 lead RCA VERSAWATT power transistor is encased in a clear block of Lucite with white background. 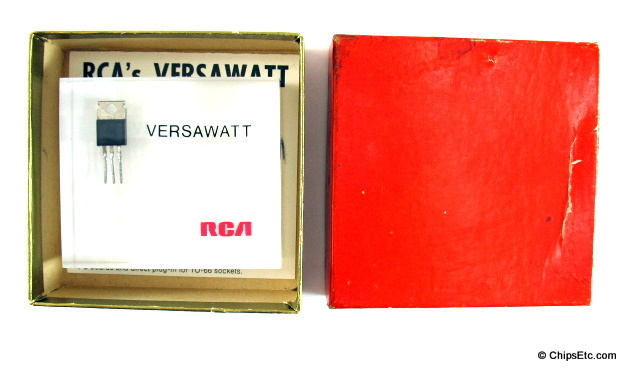 Comes in it's original box with pamphlet which explains the "volumetric efficiency" of the RCA VERSAWATT. 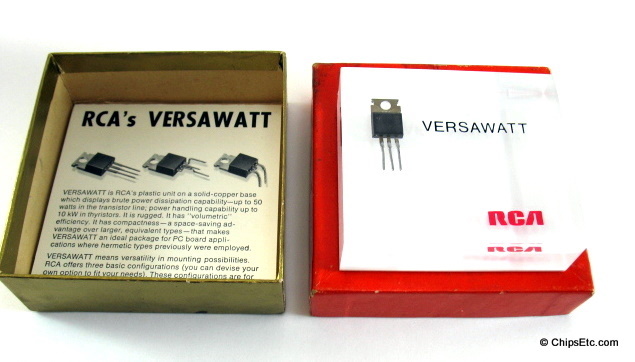 The VERSAWATT power transistor was designed for medium-power Linear & switching service in consumer, automotive & industrial applications. 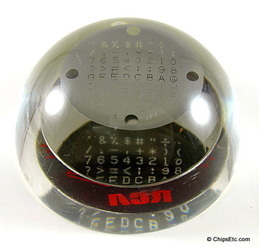 This Lucite paperweight features an RCA ATMAC II processor chip from RCA's Advanced Technology Laboratory in Moorestown, New Jersey. 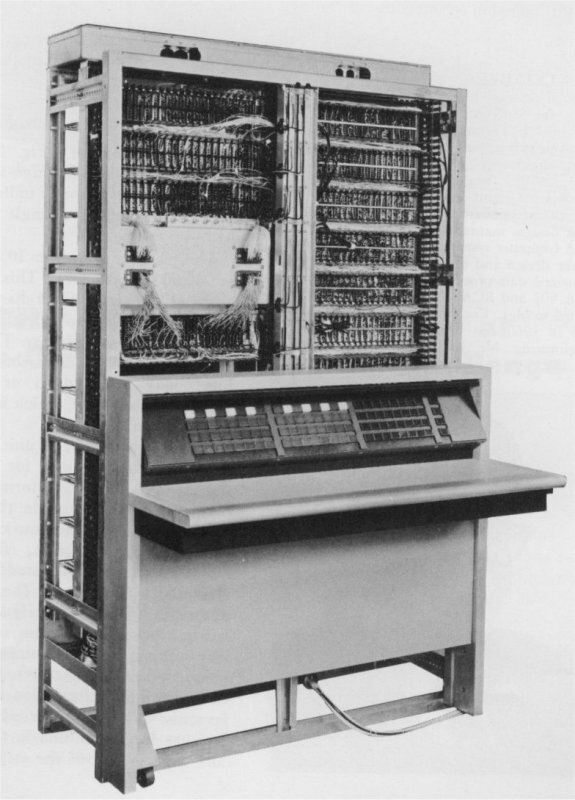 The ATMAC II was a high-speed 16-bit VLSI Microprocessor designed for low-power military applications such as radar signal processing, sonar acoustic signal processing, fingerprint identification, secure speech processing for military field telephones, and telephone voice compression. 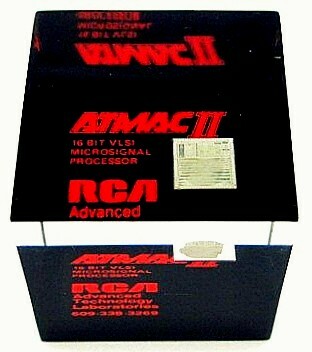 The ATMAC II was manufactured using RCA's 3 µm, radiation resistant, complementary silicon-on-sapphire (CMOS/SOS) technology.